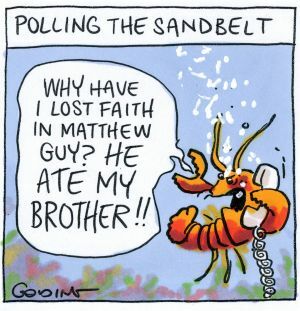 Matthew Guy, the conservative opposition leader for the Victorian State election, has made crime his number one issue for the campaign. He has a variety of other policies as well, mostly designed to satisfy the base leadership of religious fundamentalists who have taken over the once more moderate Liberal Party, or to satisfy the wishes of certain industry sectors (he doesn't like renewable energy for example). But crime and punishment is Guy's top priority, which makes it fascinating that he is either utterly wrong or being very deceptive. Both things are possible of course. One of the great lies being touted by conservative politicians is "crime is out of control". The reality is that there has been almost no change in the number of criminal incidents per 100,000 over the last ten years. 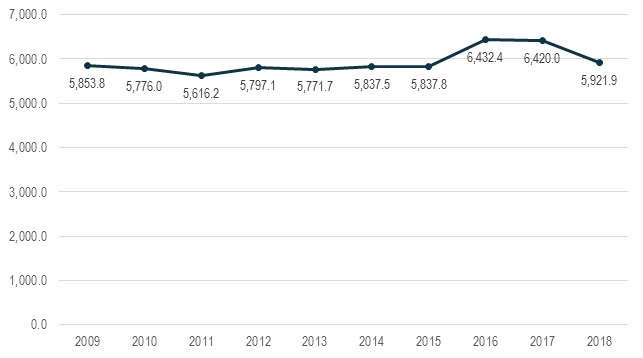 There was as jump from 5,837.8 (2015) to 6432.4 (2016) and 6420.0 (2017) but that declined to 5921.9 in 2018, which is pretty much where it's been over the past ten years. If crime is "out of control" now, it was equally "out of control" under Denis Napthine, Ted Baillieu, John Brumby etc. If it is "out of control" in Victoria, then Matthew Guy better have a sharp word to his interstate colleagues - because Victoria has the second lowest rate rate of offending, trailing only the ACT. One fairly typical statistical lie is to use absolute numbers rather than per capita numbers, such as attempted by the Liberal candidate for Bentleigh. Presumably, the candidate knows the difference between absolute and per capita figures, in which case they should acknowledge that they're deliberately deceiving people. Of course, it is possible that they don't know the difference, in which case they are merely stupid rather than malicious. Either way, they're probably not fit to be a state MP. Both Labor and the Coalition wish to build new prisons to house a larger prison population, which is a problem. The Coalition however thinks that it can turn a 700-bed facility into a 1300-one by making deals with the private sector. However, multiple studies from the past and are not more cost-effective than public ones. Whilst the Auditor-General's report this year does show 20% reduction in cost, this at least is significantly due to having a lower guard-to-prisoner ratio (how Guy intends to convert a 20% cost-efficiency to 85% is something that one will have to take on faith). A particular risk, of course, is that once you have a for-profit prison system the private owners become an industry lobby group for more people in prison, whereas the social and taxpayers interest should be to abolish and reduce crimes and close prisons. The experience in the United States shows extensive lobbying by private prison businesses that led to mandatory sentencing, various "three strikes" laws, and prevention of parole. Perhaps the most ignominious example was the "cash for kids" scandal where corrupt judges accepted kickbacks from private prison providers for increased juvenile imprisonment. In total, this creates what has been called a Prison-Industrial Complex in the United States. Is it really surprising then to discover that Guy is also going to introduce more mandatory sentencing and will increase prison populations (and private profits)? As the Law Institute points out, this "one-size fits all" is expensive, removes judicial discretion, and - quelle surprise - causes more people to end up in prison, and does not make communities safer. He [Matthew Guy] said the prison population would increase, if the Coalition is elected, due to its commitment for mandatory sentencing for an array of crimes. As a final example of a policy brain-fart, Matthew Guy seems to think that tough "boot camps" to teach discipline to young non-violent offenders to reduce recidivism is a good idea. The problem, however, as the Australian Institute of Criminology points out, is that they simply don't work (interestingly therapeutic camps do). In fact when boot camps were introduced in Queensland, they actually increased the rate of re-offending and when questions raised on how the contracts to run them were granted as costs blew out, they were shut down. It is really extraordinary that Guy thought this was a good policy to begin with. It might surprise some but there are people who have spent their lives researching the causes of youth crime, of recidivism, and how to reduce it. It might seem to be a radical idea, but occasionally listening and implementing policies that are based on evidence. We all want to live in a society that is free from violence and crimes against the person and personal property. We all have a visceral reaction when people, even random individuals whom we don't know, are affected by criminal violence. But is it really too much to ask that politicians advocate policies that are proven to work? Is the lure of appealing to the retribution of rough justice for the purpose of attaining political power too great? For just a moment, let us assume that we actually want to have a criminal system that is based on evidence, and one that works - regardless of political partisanship. Fortunately, such information is often available. Removing victimless crimes altogether, or at the very least, converting them to civil rather than criminal offenses is an obvious first step. Recent trends which encourage restorative justice, directly involving the victim and offender's input to the means of restitution and rehabilitation, shows the highest rate of victim satisfaction and offender accountability. Restorative justice methods have also been used in prisons, to assist with rehabilitation and reintegration, and there is good evidence that it significantly reduces recidivism. Finally, and most challengingly, there is the strongest correlation between crime and economic inequality, well-recognised globally and locally, even to the level of incidence of homicide. When one reviews the Victorian Ombudsman's report on prisoner statistics in 2015, we find that 40% of prisoners have a mental health condition, 42% of male prisoners and 33% of female prisoners had a cognitive disability, 35% of prisoners were homeless before their arrest, more than 50% prisoners were unemployed, and more than 85% prisoners had not finished high school. Where, we may ask, are the brave politicians, who are prepared to address the causes of crime, rather than those who wish to profit from it? Commenting on this Story will be automatically closed on January 19, 2019. David Speers asks him to address the point that there’s not a strong evidence base for mandatory sentences. Guy says he’s not interested. Guy: What I am going to rely on, David, is making sure that those people are off the streets. i.e., he doesn't actually care whether mandatory sentencing works or not, he just wants to lock people up, the consequences be damned. Matthew Guy has stood down as Liberal leader, four days after the Coalition's disastrous election loss.